Over the years, with your help, Shareaholic has grown from a nights and weekends project to becoming the preferred acquisition, engagement and measurement platform for more than 340,000 websites (and growing!). Each month, over 400 million people use Shareaholic to discover and share content across the globe. As I’m sure you can imagine, developing and maintaining a free high-quality service is also expensive! Fortunately, developments in traditional and native advertising have paved the way for businesses like ours to generate the revenue we need to support our business while minimizing the impact on you: our customer! While brainstorming the “right” ways to incorporate some of these options, we came to an important conclusion: there is no “right” way until we have conducted the proper tests and gotten feedback from you! Starting today, we are beginning to test products and features that will help support our services and in the future earn revenue for you too (more on this below)! 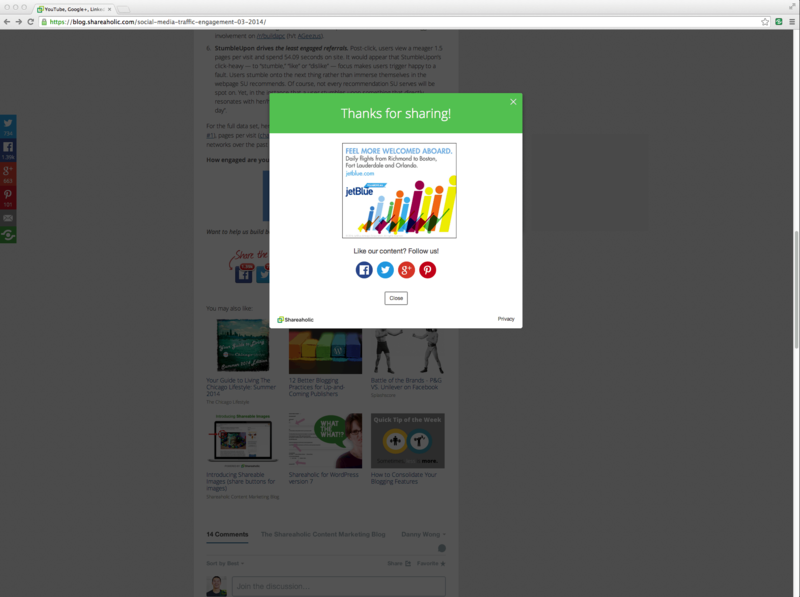 Our first step: Incorporating a targeted display ad in the “Thank You For Sharing” window. Any ads we surface will be high quality, personalized and relevant to the reader, so you don’t have to worry about compromising your audience’s experience in any way. Also, we’ve made it super easy for you to report ads you don’t like and submit feedback: simply send us an email! As always, we are committed to complete transparency, so you can make informed decisions every step of the way. If you don’t like something, have a suggestion or simply want to say hi, please feel free to send us an email! A HUGE thank you to our supporters and especially all our users for the support you’ve given us over the years. We’re here because of you and can’t wait to share what we have in store for you!